It was a sunny, dry day in late November, yet another in a string of long dry streaks that La Nina had brought to the beginning of our '02/'03 winter. Six months ago my brother had shown me a picture of Ohanapecosh Falls, a blurry print out from Bryan Swans 'Waterfalls of the Northwest' website. Ever since he had been trying to talk me into trekking boats to the upper reaches of the Ohani. Although the photo was taken from an awkward angle, the falls looked enticing. 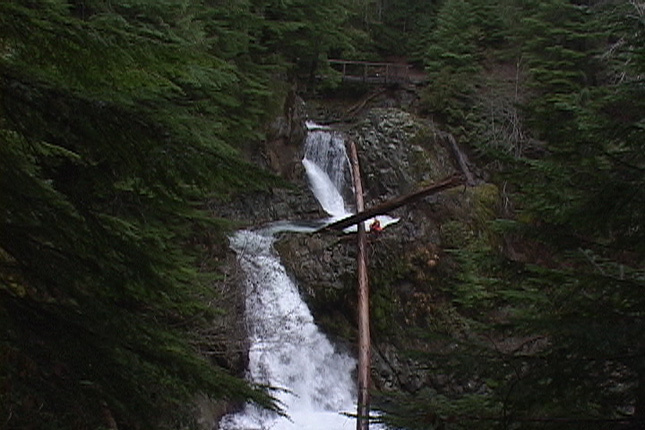 A nice two tiered waterfall with a long skinny log running diagonally along the side. Still, it was not an easy sell to hike a boat 3 miles for one waterfall. It was actually the low levels and lack of anything else to kayak that drove me to finally make the pilgrimage into the Upper Ohanapecosh. Jordan talked me into it, and I talked Jesse Bierman into it. And Tom Frisch talked a small camera crew into it. So with a dawn start we trundled down the Owyhigh Lakes trail head. Taking the trail down river along Chinook Creek we carried our boats since the water level was too low to paddle. About 1.5 miles downstream we found Stafford Falls. We stopped and ran it at least three times each. 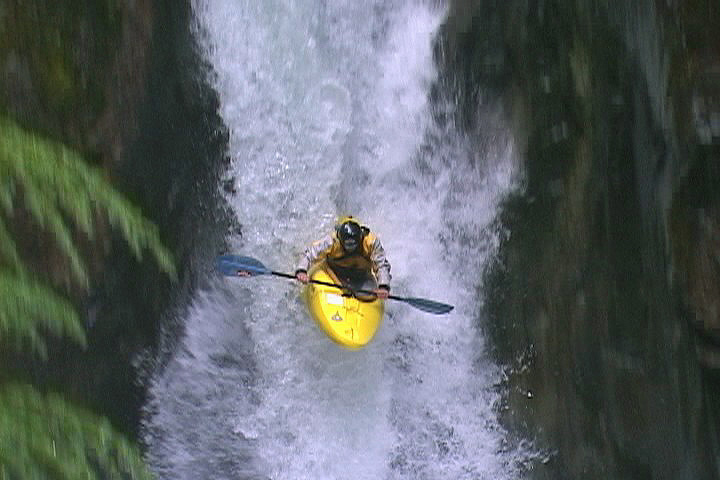 It was a really fun double-drop waterfall consisting of an entry move off a pour over that dropped into a swirling pool...then three or four paddle strokes and over the main 20 foot waterfall. I've seen this falls at higher water and chose not to run it because the boil pushing into the undercut in the middle pool was pretty hectic. 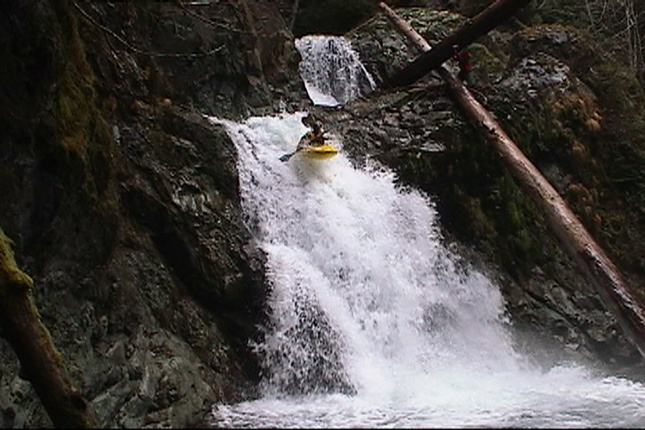 The first and second drops on Stafford Falls. Having run our laps on Stafford Falls we shouldered our boats once again and took to the trail. Veering away from Chinook Creek, the trail turns north eventually crossing the Upper Ohanapecosh and then heads off into the expanse of the Cowlitz Divide. 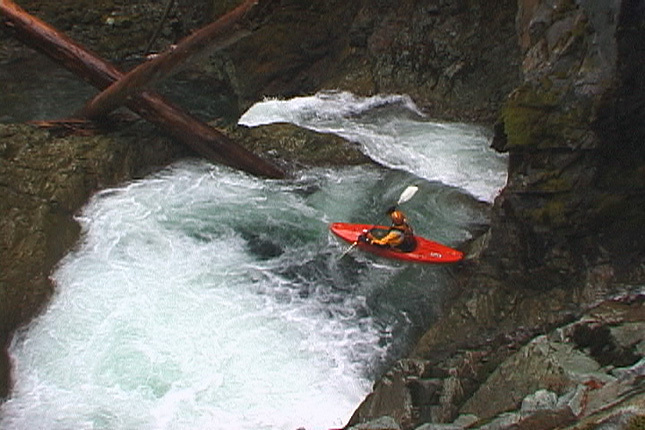 Chinook Creel merges into the Ohani 1.5 miles down stream, about 6 miles above the well known Ohanapecosh run. Our plan was to follow the trail to where it crosses the Upper Ohani, put in there, and paddle through the remote Upper Ohanapecosh gorge down to Road 123 where the Ohani and Chinook Creek merge. It didn't take us long to hike the 1.5 miles to the Ohanapecosh where we found a rickety bridge crossing over Ohanapecosh Falls; a two tiered waterfall consisting of a 20-footer into a small pool, then an off-vertical 30-footer. We quickly determined that the first tier was a no-go because the only line was a nasty slot that would probably scrape the elbows off your drytop and there was a piton-threatening shelf jutting out at the bottom. At higher water you may be able to take a cleaner route off a slab on river left. The lower tier looked great so we put in the pool below the first tier and ran it. I went first and I couldn't help but take a big boof stroke off the lip. A few seconds later my nose paid for it but I couldn't hold back. The boof was on impulse. I had eddied out above the falls, the current swung my nose perfectly so I was pointing for the green wave at the lip. I felt myself rising into a launch on the wave and I just had to take that stroke. It was a glorious moment of air. But Ohanapecosh falls is not totally vertical. 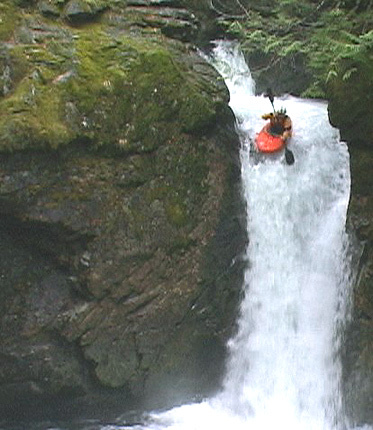 I bounced onto the lower slab of the falls which dropped my boat into a pencil position. I splashed into the landing pool...and went deep...and bounced off the bottom. When I rolled up I knew the nose of my boat was dented. And Jesse's laughing confirmed this. Jesse and Jordan refrained from launching off the wave and instead let the nose of their boats drop over the lip of the falls. That way the slab at the base kicked them into an angled landing. Jesse apparently came off a little too angled and felt an impact to his crotch area, so he didn't want to run it again. That can happen when dropping 30 feet into a small pool; you may injure your cajones. The pool was small enough that when you landed a noticeable ripple spread across. While Jordan ran a second lap I was assessing the damage to the nose of my boat from penciling in too deep and hitting bottom. It was a really fun falls and I wanted to run it twice, but daylight was waning and we still had to navigate the gorge and reach the car by daylight. So we parted ways with our ground crew, planning to have them pick us up at Road 123. They backtracked to the trail head where we had started, and Jesse, Jordan, and I drifted into the unknown gorge. The gorge walls narrowed up right away. We paddled through calm pools in crystal clear water. Between the pools were ledges that were slotty and at least one had a log in the main slot. We portaged a few of the tallest ones. Maybe you could run them at higher water. However if you were in there when the vertical walls of the gorge were filled with water you likely wouldn't have a choice. The gorge was continuously tight and we could see watermarks high on the walls, scars left from the almost constant run off from the Ohanapecosh Glacier's high snow pack. It became apparent that the river rarely reaches levels this low, and this was a rare opportunity when the gorge could be explored safely. Further down the gorge we came to a large horizon line. 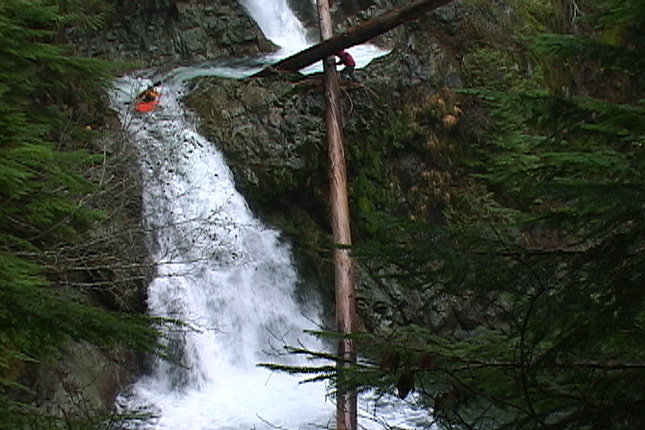 It was a 15 foot ledge drop formed by a giant log wedged between the walls of the gorge. We found a small shelf on the side where one person could peer down and see the landing. It was a nasty myriad of logs and sticks that jutted straight up like a bed of nails. From the shelf we could throw our boats out into a pool that was clear of the wood spikes. But it was too far to jump. Jordan went to the other side of the creek to see if there was a way to get down there. We all held our breath as he down climbed the gorge wall until he reached a blank spot where the holds ran out. There was a small flat section of the wood pile that looked like he might be able to jump onto from where he was. Once again we all held our breath (and cringed) as he jumped down onto the wood stance, hoping it wouldn't collapse and swallow him into the deep pile. But it held, and from there his final move to get down was to jump out, clearing a couple boulders we could see under water, and land in a deep spot in the cold clear pool below. He made the jump and as he clawed his way out of the pool the redness in his face gave us a big hint about the chill factor. Once he was down, Jesse threw the boats off the shelf into the pool where Jordan had jumped. Jordan gathered the boats as Jesse and I followed his dicey descent path gasping and snorting to get out of the icy cold pool as fast as possible. Once back in our boats we paddled fast trying to get warmed back up. 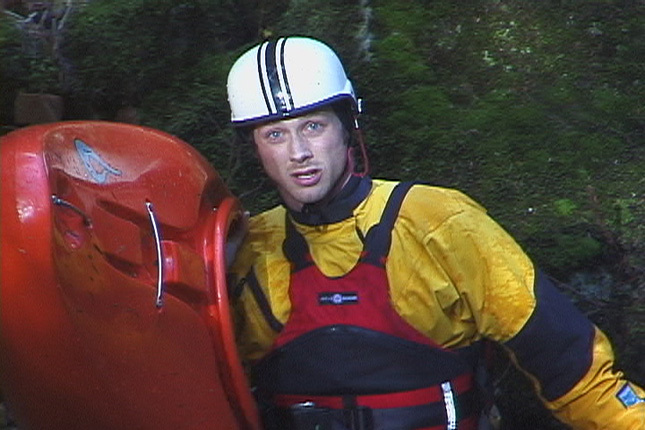 Jesse realizes he's going to have to jump into the cold pool in the upper gorge to complete the flying portage over the log jammed falls. Very abruptly the gorge walls ended and we were back in the open daylight of the forest. After a short time we reached the confluence with Chinook Creek and Road 123. The rest of our group that hiked out pulled off onto the shoulder. I lifted the nose of my boat to show the damage from Ohanapecosh Falls, but the dent was gone! Seems Liquid Logics are self repairing - the dent had completely worked itself out. I had a new appreciation for finding great waterfalls to run at a time when nothing else in the area was running. And next time I'm on one of my favorite runs I'll think about the Upper Ohanapecosh and know that if there is enough water to be where I am, then the entire confines of the tight Upper Ohani Gorge are probably boiling and surging out of control.